Thanks to Marketing Lessons from the Grateful Dead we know that the band’s approach over the years offers useful insights for marketers. But how is the organization itself doing with social media today? 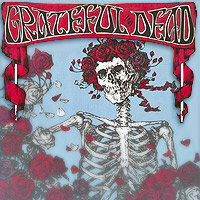 Based on a current promotion on the Grateful Dead Facebook page I’d say they’re doing great. 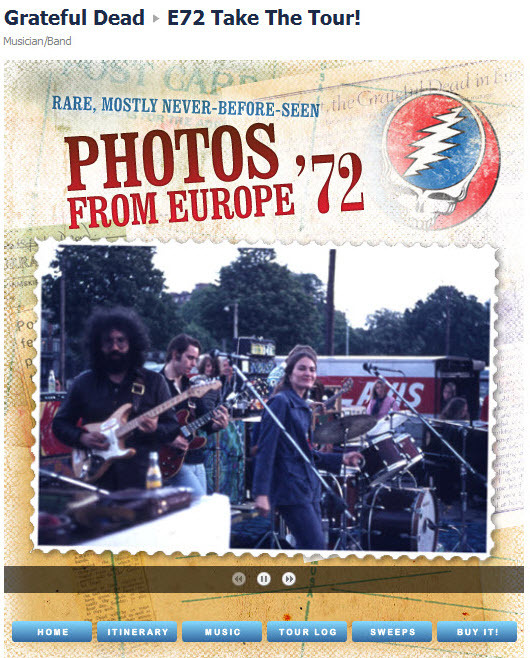 In support of the release of the complete recordings from the Europe ’72 tour (and the 40th anniversary of that tour) the Grateful Dead Facebook page utilizes a separate tab to create a multi-page interactive experience for fans. Users can follow the tour route on an animated map, view set lists and photos and read accounts from people who were at each show. 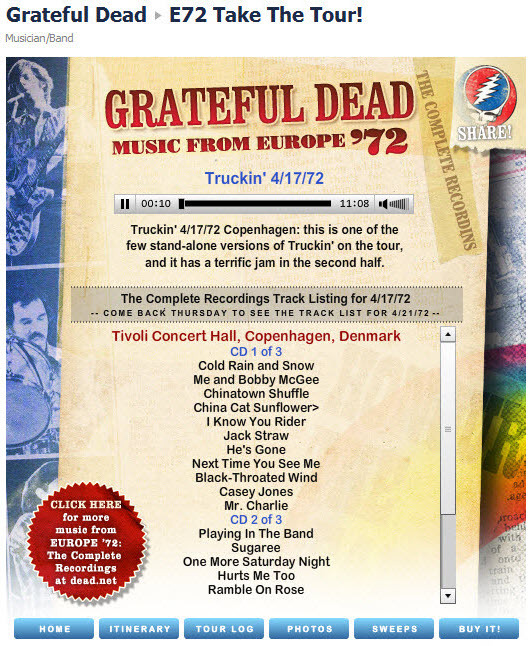 Best of all, a live track from each date is streamed right from the tab. It’s not every day you hear a rip-roaring Truckin’ suddenly jump out of a Facebook page. The tab also includes a sweepstakes which allows them to collect fan email addresses and of course a link for buying the complete recordings. In terms of the technical setup I like how the use of sub-navigation buttons makes it possible to offer a multi-page experience within the same tab (see below). And effective use of colorful, interactive pages with multimedia content brings it all to life. An image and a more compelling message will significantly improve the click-through rate. The challenge for the modern Grateful Dead (and their label / business manager Rhino) is to market like the Dead did back before online media. Build a following & get people to share. 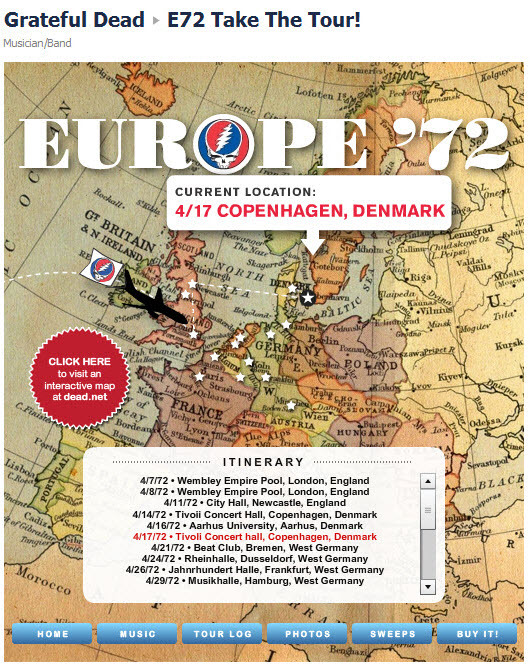 They did a great job tapping the ideas they pioneered in the marketing of the Europe ’72 collection. Well said, thanks David. 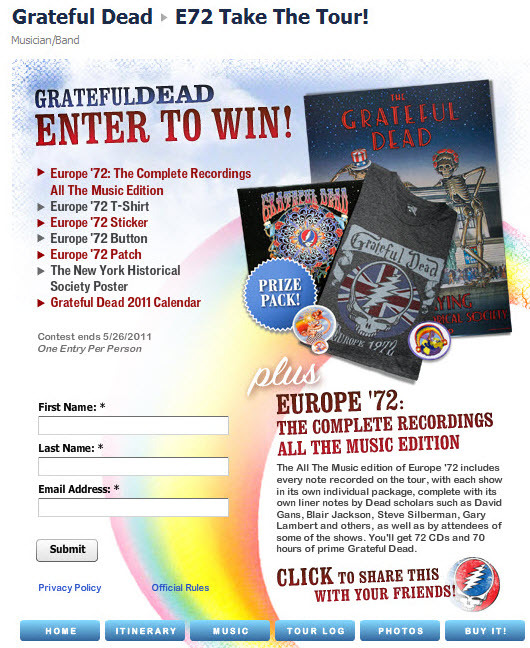 The Europe ’72 collection promotions both on Facebook and on Dead.net have come together nicely. 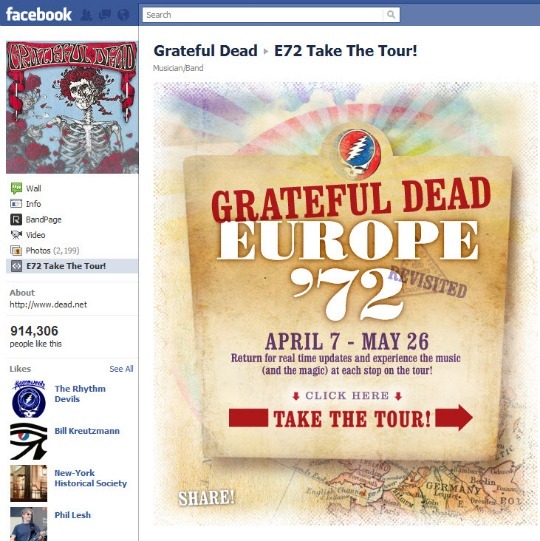 Regarding getting people to share, all the more reason to improve the formatting of the Facebook message that’s generated when users click the “Share” button on any of the pages with the Europe ’72 feature. They missing the opportunity to help their fans make a stronger impression with those shares. Great example of how to use Facebook as an effective marketing tool. 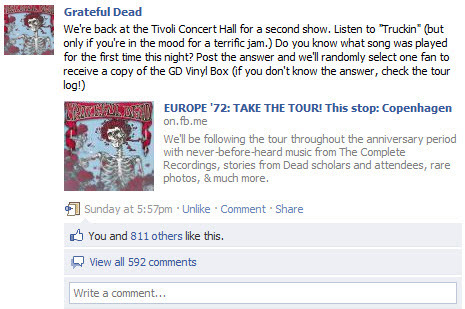 I especially like that the posts are mimicking the tour from 40 years ago and encourage commenting via a contest. It’s a great way to maintain fan interest and stay top of mind. I agree Nick, following the tour route is pretty cool, it definitely pulled me in.